Over the last decade Hostess has been mismanaged by bankers, not bakers. 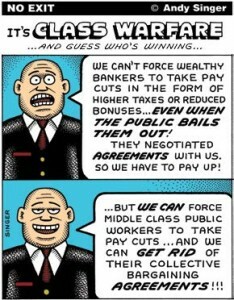 Private equity firms “Bainstyle vulture capitalists,” as AFL-CIO President Richard Trumka explained in an article for the Daily Kos, “invested in Hostess to profit not by making quality products, but by bleeding the company of every dollar before discarding it.” The company has filed for bankruptcy twice in the last 10 years, forcing contract concessions from the nearly 15,000 unionized employees. Hostess has had six different CEOs since 2004. With the current CEO, Gregory Rayburn, receiving a 300 percent increase in compensation. The management firm raised the pay of the top nine executives between 35 to 80 percent all while asking employees to take cuts of more than 30 percent. In addition, executives overseeing liquidation of the company will receive 1.75 million in bonuses. The company also stopped paying into the Multi Employer Pension Plan (MEPP)—which is reportedly underfunded by as much as $2 billion. The truth is that the Bakery Workers union, along with the other unions representing workers at Hostess, gave the company more than $110 million in annual concessions to help it restructure after its 2004 Chapter 11 bankruptcy filing. According to documents filed by BCTGM with the bankruptcy court—concessions were given in exchange for assurances by the company that it would restructure itself in a manner that would provide a real plan for establishing a stable business with secure jobs for thousands of employees. As part of the negotiations during the first bankruptcy filing the company said that they would reinvest the monies saved through the BCTGM’s concessions in the company, specifically promising to focus on brand building, modernizing its plants and trucks, investing in new technology that other baking companies were employing and, importantly, developing new products to increase revenue in the face of a national trend away from sweet goods and bleached flour breads. However, upon emergence, the debtors were burdened with $773 million in secured debt—in excess of $100 million more than the 2004 Debtors had when the cases were initially filed. The BCTGM told the Debtors prior to emergence that this increased debt load—unheard of in a chapter 11 process—would make it impossible for the Company to keep its promises and would inevitably result in a second bankruptcy. It was right. Instead of reinvesting the money saved as a result of the BCTGM’s concessions, plant machinery was not replaced, new technology was ignored, and new product development never occurred. The Company’s debt continued to grow, and its sales and revenue decreased. Fast forward to 2012, Hostess earned profits of more than $2.5 billion but ended up with a loss of $341 million as it struggled to pay the interest on the $1 billion in debt the management firm had saddled it with over the last eight years. Silver Point and Monarch, two hedge fund firms specializing in distressed debt, had purchased controlling interest in the company after the initial Chapter 11 filing. The two firms cared little about building a successful company. For these distressed-debt specialists it is all about the bottom line. 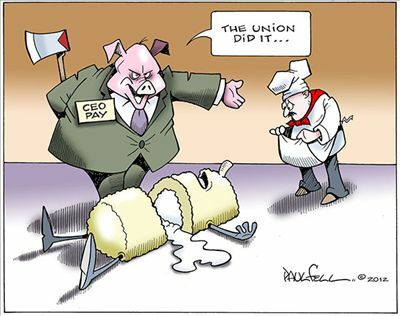 They will make more money from the liquidation of the company’s assets than they would have from the success of Hostess. 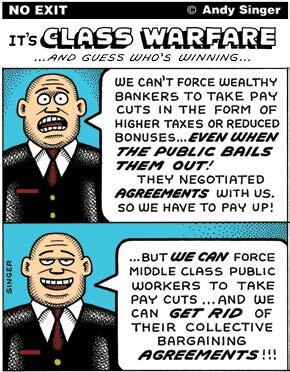 Picking the bones clean, they’ll line the pockets of their shareholders while 15,000 good middle-class jobs are gone. Had the BCTGM given in and allowed the company to abrogate the union contracts, those same 15,000 middle-class jobs would be gone. 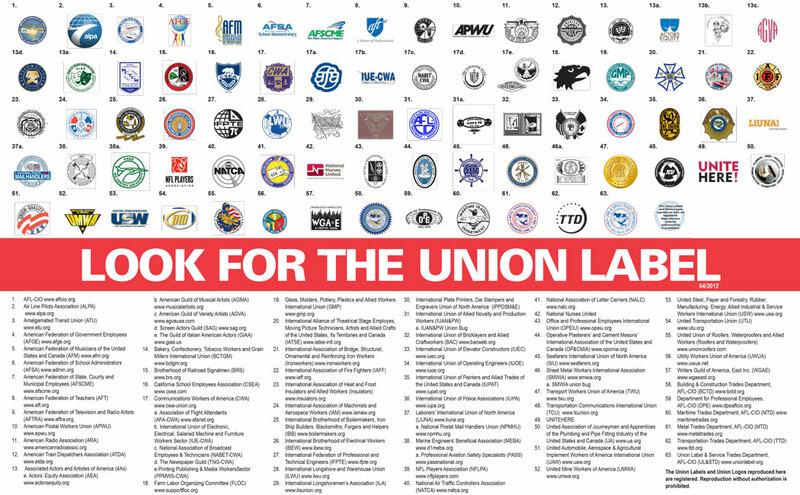 The Union Label Department develops this poster identifying the many AFL-CIO affiliated unions. 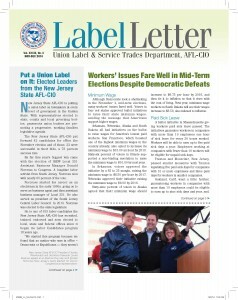 Many of these union labels have a long and storied history. Since late 2012 the Union Label Department has been featuring information on modern day union labels in our bimonthly newsletter, the Label Letter. 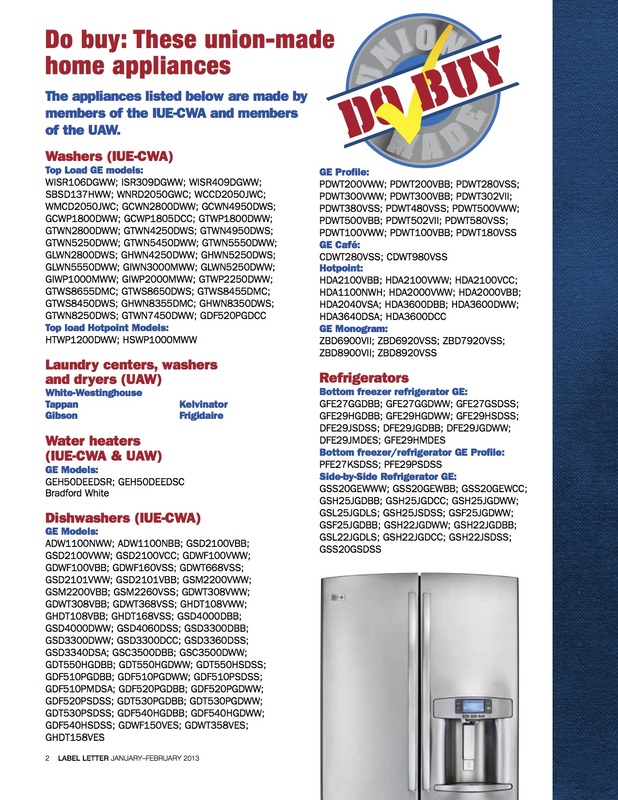 You can learn about some of these labels in our “Spotlight the Label” features posted online and in our newsletter. In 1881, along with the birth of the American Federation of Labor came the clasped hands symbol that has lasted, with only minor alterations, until today. These and other facts about the label movement are thoroughly discussed in “Signs of Unity: Stories and Symbols of the American Labor Movement,” a book by Kim Munson. As Ms. Munson explains in her research “the symbols and messages contained in these logos have changed due to union mergers, economic transformations, changes in the political climate, and cultural/societal trends in general.” Our goal is to educate the general population about the modern day labels they may see today. What can America do to restrain these big banks? The Justice Dept. has levied fines against banks like HSBC—which was just found to have been laundering millions for Mexican and Columbian drug cartels—but the settlements are equivalent to just weeks of profit for the banks. Other banks have also paid fines for violating U.S. banking rules: Credit Suisse, $536 million; Barclays, $298 million; Lloyd’s, $350 million; ING, $619 million; and the Royal Bank of Scotland, $500 million. Not one executive, not one employee of these institutions, was criminally convicted. According to the Justice Dept., criminal convictions at HSBC would have led the bank to collapse and thus cause the fragile financial system to collapse as well. According to David Cardona, a former deputy assistant director at the FBI, securing a criminal prosecution is too difficult. Civil penalties carry a lower burden of proof. Many legal experts have said the U.S. government faces an uphill battle in prosecuting financial-industry executives. Criminal intent is especially hard to prove in complex financial cases, because prosecutors must convince jurors, beyond a reasonable doubt, that a fraud was intentional. If crime pays, as it clearly has in these money laundering schemes, the crime continues. The drug trade and terrorism continue to thrive because the criminal organizations have ways to spend their profits without repercussions. There is generally no tax revenue generated by laundered money, so the rest of the public has to make up the difference in lost taxes. In the Libor scandal, the participating banks probably made loads of money while municipalities and other organizations saw their debt ratings decline. It’s difficult to pin down, still, how widespread the damage was from the manipulation. What’s not difficult is figuring out that no one in the U.S. has suffered a criminal charge from the manipulation. banks known as resolution authority (without resorting to bailouts). It’s supposed to subject the large institutions to more stringent oversight and give the government the power to liquidate a bank that has overstepped its bounds. Former Rep. Barney Frank, who sponsored the Dodd-Frank law, called resolution authority a “death panel” for banks, but still, the 10 largest banks control 54 percent of the deposits in the U.S. No one is using the authority of Dodd-Frank and the largest banks are still acting with impunity. investment banks. In effect, he says: bring back the Glass-Steagall Act of 1933 which led to half a century, free of financial crises.” Using the authority of the Dodd-Frank or returning the regulations imposed by Glass-Steagall clearly needs to be a focus of U.S. regulators if they want to rein in any future misdeeds.